The debate between sugars versus artificial sweeteners has been going on for decades. Public Health England, celebrity chefs, diet enthusiasts and health officials constantly drum into the publics’ mind that replacing sugar in food and drink with a substitute is the way forward to combatting obesity and living a fuller, healthier life. But, and it’s a BIG BUT… is this true? 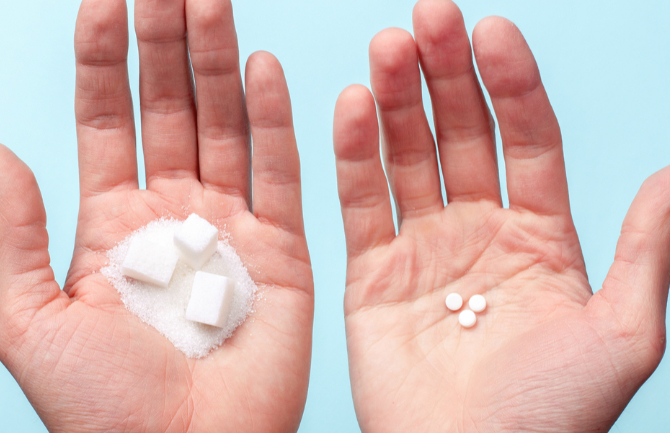 Are artificial sweeteners really the best option to curb obesity? This is a very controversial topic, where research by scientists and food & drink specialists has shown that artificial sweeteners aren’t all sweetness and nice, they can actually be harmful to the human body. Sucralose, aspartame and other similar substitutes have dominated the weight loss world for such a long time; however, it may now be time that scientists can finally take them off their pedestal. “Artificial sweeteners are not risk-free,” says Brian Hoffmann, Ph.D., assistant professor in the Department of Biomedical Engineering at the Medical College of Wisconsin and Marquette University, declared. Hoffman indicated that his recent research findings show that artificial sweeteners contribute to “metabolic disorder and disease through an entirely different pathway compared to (normal) sugar.” The research shows that these sugar substitutes change the way certain specific genes, which are responsible for breaking down fats and proteins, work. Using rats and human cell cultures, Hoffman and his team of scientists found that in just three weeks of exposure to aspartame and acesulfame potassium, two common sweeteners, the select genes charged with lipid metabolism, were altered. Hoffman and his team have shown that artificial sweeteners cause metabolic changes at a genetic level — changes that do not take place when regular sugar is consumed. There has been research in past years suggesting that sugar substitutes can increase the risk of diabetes by up to 500%. Plus, research published online at stroke.ahajournals.org revealed that, over a 10 year period, one can of diet drink or more on a daily basis was associated with a three times increased risk for stroke and dementia, compared with consumers who drank regular beverages. Further research by the U.S National Institutes of Health show that malodextrin, a food additive commonly used in some sugar substitutes may cause Crohn’s disease, as it encourages the growth of the bacteria E. coli in the small intestine. These are just a small handful of studies that have show that while artificial sweeteners may be low in calories, they are not good for the human body.